The winery Toni Jost in Bacharach is owned by the family Jost since 1831. Currently the winery is run by winemaker Cecilia Jost in sixth generation together with her father Peter Jost. The name Hahnenhof (Hahn = rooster and Hof = court) results from the fact that within the last 180 years, the family has consistently increased their share of the famous single vineyard Bacharacher Hahn to a nearly sole ownership. 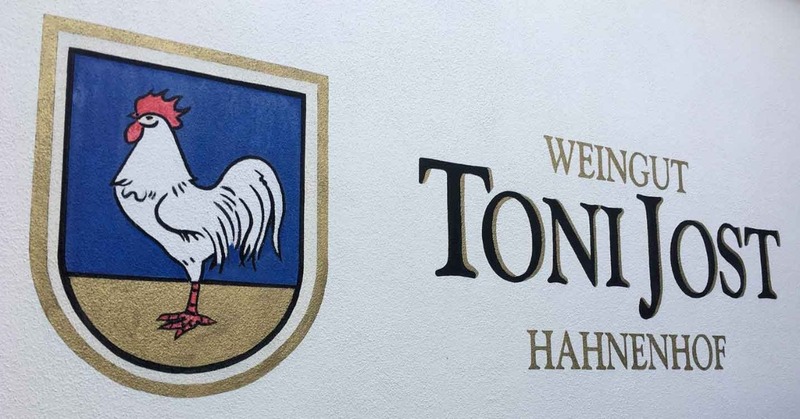 The winery Toni Jost consists of about 15 hectar of vineyards, of which 80% are plantet with Riesling grapes, 15% with Pinot Noir and the remaining parts with Pinot Blanc and Dunkelfelder. One third of the vineyards is located on the other side of the Rhine river, in the subdistricts Walluf and Martinsthal of the Rheingau. The Rheingau part of the winery is owned by the family Jost since 200 years. As a result of the strong focus on the best single vineyards and the production of high quality Rieslings and Pinot Noirs, the winery belongs to the top of the Middle Rhine wineries. In the Falstaff Wineguide the wines of the winery Toni Jost are rated between 88-93 points, and in the VINUM Wineguide they are rated with 3 grapes.